One of the joys of working at Sycamore is getting to know the inspiring people who are involved with the organization. Lee Sterrenburg is just such a person – an exceptional birder and environmentalist who helped create the Goose Pond Fish & Wildlife Area, and received the Sagamore of the Wabash Award (Indiana’s highest State honor) for his conservation work; an educator who brought together English and science in his career as a professor at IU; and a long-time member and volunteer who has made Sycamore a beneficiary of his estate plan. Lee’s love for birds, being in nature, and reading about biologists and explorers started as a boy in San Diego. He spent time at the San Diego Zoo and San Diego Natural History Museum, and joined the Audubon Society and participated in bird counts. He also visited relatives in Wisconsin who had land in an area known for birding, hunting, and fishing, and were influenced by Aldo Leopold’s conservation work. Lee came to IU during the early 1970s to teach English and Victorian Studies. In the 1980s he participated in a multidisciplinary faculty seminar on “Charles Darwin in Context.” The late Dan Willard was also a faculty member in the seminar. “I read a lot of Charles Darwin’s works, and also writings of Alexander von Humboldt in translation, and the 19th-century geologist Charles Lyell. This led me to teaching graduate seminars on Darwin in context and also co-teaching a combined English and School of Environmental Affairs graduate and undergraduate course with Dan Willard. Our team taught a course focused heavily on wetlands and rivers.” (Dan was later a founding member of Sycamore Land Trust). In the year 2000 and after, Lee became very involved with a group of people working with the Indiana Department of Natural Resources to find a way to purchase more than 8,000 acres of farmland to create a wildlife habitat in Greene County. Within five years, the land was purchased with the help of many organizations, including Sycamore Land Trust, and the Goose Pond Fish and Wildlife Area was established. It is one of the most successful wetland and grassland habitat restoration projects in the U.S., famous for its whooping cranes, snow geese, and other wildlife. 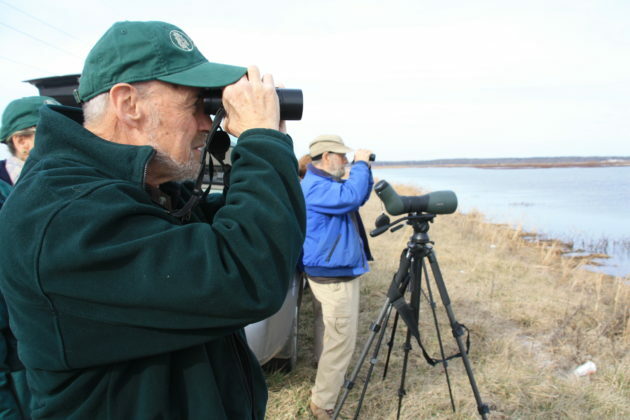 Lee continues to be a very active bird monitoring volunteer at Goose Pond FWA. Sycamore’s recent purchase of a keystone property to add to Goose Pond FWA has been especially meaningful for Lee. What has been your experience with Sycamore? Why is it important to you to support Sycamore in your estate plans?